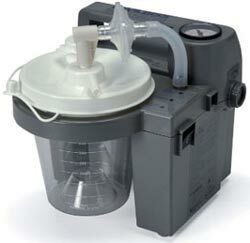 Medical suction machines are used for various medical reasons in a hospital setting but the home models are primarily used for respiratory conditions. Respiratory conditions often result in secretions of mucus or serum that must be removed from the body. When the patient isn't able to cough up these secretions the aid of a suction machine is required to clear the lungs and airways. Prior to the development and availability of suction machines patients who needed suction treatments had to visit a hospital or clinic where the procedure could be done. Additionally, patients who had to have suction treatments performed often and regularly were never able to be released from hospital before home suction equipment was available. In addition to people who have respiratory conditions, people who have either temporary or permanent tracheotomies will often require suctioning as their tracheotomies may cause the creation of mucus secretions that can not be cleared by the patient. Suction machines use a long thin flexible plastic tube known as a catheter to vacuum out the secretions blocking the airways. These secretions are	collected in a jar attached to the machine and can be emptied after the suctioning is completed. The collection bottle on suction machines must be cleaned after each use. Because the collection bottles can be made of different materials (glass, plastic etc. ), the cleaning directions will be different between suction machine models and the manufacturer will supply directions for each model. The tubing that the catheter is connected to also needs to be cleaned after every use. Generally, the tubing should be rinsed thoroughly after every use by running hot tap water through it followed by a solution of one part vinegar to three parts hot water. Rinse with hot tap water and air dry. Individual manufacturers may have different cleaning directions and the suction machine owners manual should be consulted. Suction catheters can also be cleaned but may need to be replaced more often than the other suction machine parts. Check with either the prescriber or catheter supplier for replacement and cleaning guidelines. Sction machines are equipped with bacteria filters to prevent bacteia from the secretions suctioned from escaping the collection bottle. Generally these filters should be replaced every two months or so depending on the amount of use the machine has or any time the collection bottle overflows. Suction machines are available as 110 volt systems that run on house current, rechargable battery systems or an combination of both. Patients who require frequent suction treatments should probably consider a model that offers rechargable batteries to be safe in the instance of a power failure.